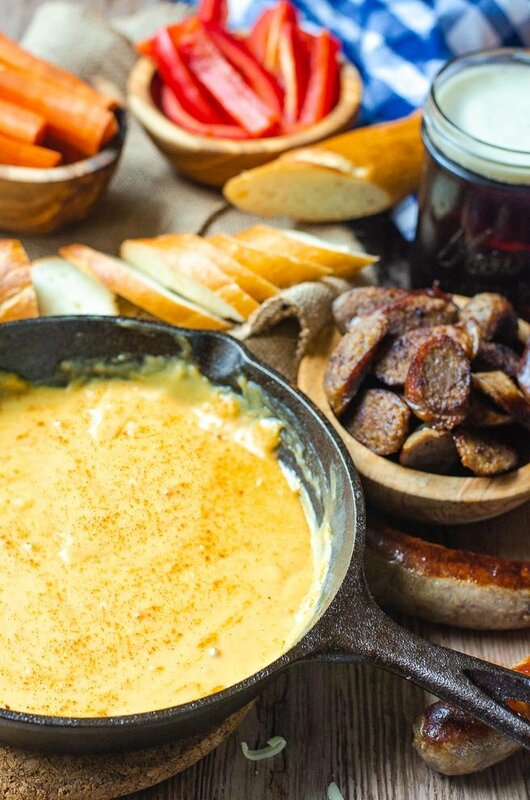 Use this beer cheese dip recipe as a complement to soft pretzels, sausages, or with tortilla chips. This game day favorite is super easy with just and can be as smoky as you want. 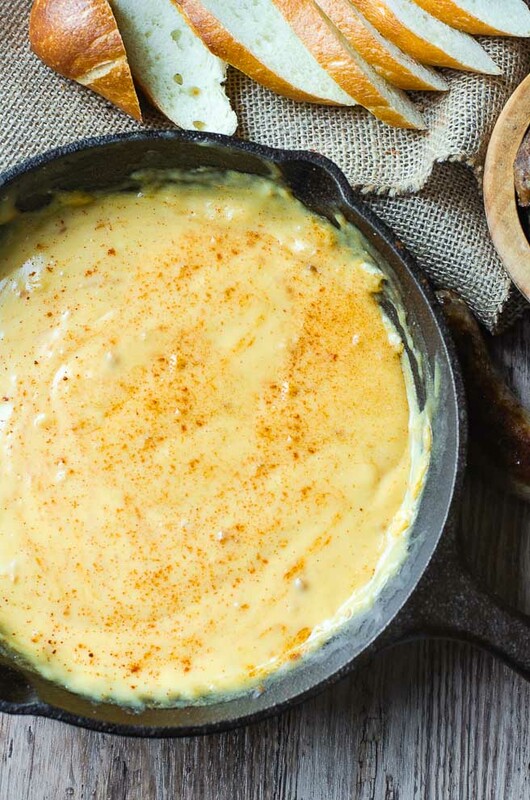 Beer cheese dip is the ultimate game day appetizer. Made with extra sharp white cheddar cheese, garlic, and your favorite beer, the combination is a super bowl hit. Most people serve it with pretzels, but for today’s recipe, I’m using some delicious seared sausage slices. Don’t worry though, you can always put some additional soft pretzel bites on the side for a more traditional dip. What Kind of Beer For Beer Cheese Dip? When you choose the beer for this beer cheese dip recipe, the important thing is to choose one you like. If you’re not a fan of deep and malty beers, don’t choose a stout. If you hate hoppy beers, avoid IPA’s. The beer you choose greatly affects the flavor, so choose according to you (or your guest’s) tastes. If you’re not a beer drinker, or you’re just not sure where to start, I recommend an amber or a red. (A “red” is a type of beer. I didn’t forget to finish the sentence.) Both of these tend to be middle-of-the-road in flavor, with a balance of both hops and malts. Can Beer Cheese Dip Be Made Ahead? If you are serving your dip cold, making it ahead is easy. In fact, I recommend it. It gives the beer flavor time to truly impart itself so it shines. If you’re serving the dip hot, you can make it ahead, but there will be a few things to watch for. Primarily in the reheating. When you reheat the beer cheese dip, you want it to reheat as evenly as possible. The best way to do this is to use a low heat so it doesn’t scorch to the side of the pot. Also, as the dip chills in the refrigerator, it will turn into a blob. Cut the cheddar cheese mass into uniform sized pieces before melting. This helps keep the outside from burning before the middle heats through. Tortilla Chips (find the tri-colored ones for an extra beautiful presentation). If you want a beer cheese dip that is out of this world, I recommend brushing up on these culinary techniques. You’ll be so glad you did. How To Get Crisp Crudité Veggies. This method is called “blanching and shocking” and gives you crisp, but slightly cooked vegetables for dipping. Additionally, it locks in the bright color of the veggies so they are vibrant. Buy and Store Apples. If you choose to use apple slices, check out this post for tips on buying the right kind of apples for this dip recipe. How To Make A Roux. This is how the beer cheese dip is thickened. If you incorporate the liquid incorrectly, it can leave the dip clumpy. This post is a collaboration celebrating National Cheese Lovers Day. If you want to check out some of the other cheesy delicious recipes, look below. Don’t skip the step of simmering the beer and roux (the butter and flour mixture.) This helps remove the taste of the flour and gives your beer cheese dip a much better flavor. It’s only five minutes. Want a free printable grocery list for this beer cheese dip recipe? Get it HERE. The smoky flavor of this white cheddar beer cheese dip can be as light or as strong as you want. Dip some fresh veggies, bread, chips, or sausages into this dip for a great game day appetizer. In a 6 inch cast iron pan over medium heat, melt the butter. Add in the minced garlic and cook until translucent. Stir in the flour and let cook for one minute. Reduce the heat and slowly stir in the beer and mustard. Simmer for [/timer]5 minutes and stir in the cheese until melted. Add in the smoked paprika and serve. For a stronger smoky flavor, trade out the regular cheddar cheese for a smoked cheddar cheese. Since most shredded cheese from the store has an anti-caking ingredient added, your beer cheese dip will have a better texture if you freshly grate the cheese. That looks positively sinful, in a good way! 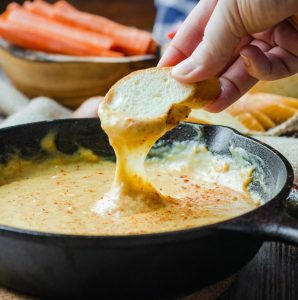 This recipe is pretty hard to resist…what would I not want to dip in this amazing cheesy dip??? Always looking for delicious game day food! Love the idea of dipping pretzels, yum! Yes! And it works super well with soft pretzels or store bought pretzels. Oh wow this dip looks incredible. 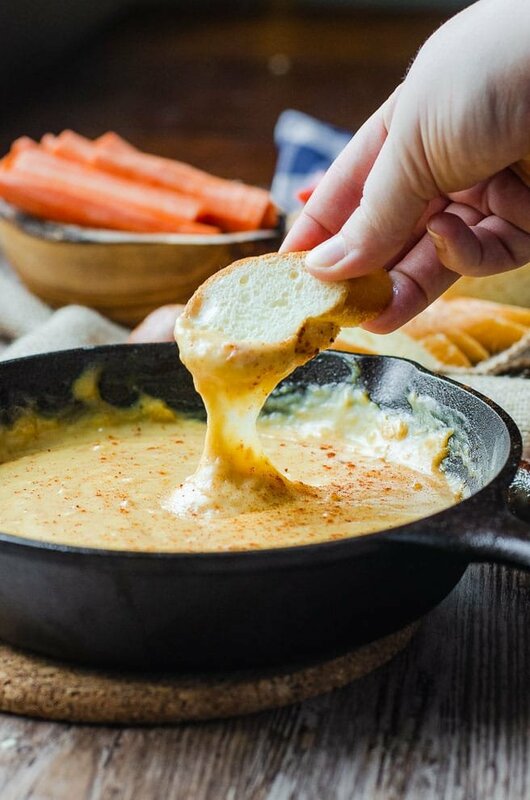 I seriously cannot resist a cheesy, warm dip like this. I’m going to have it with allllll the pretzels! I’m with you there, Amy. Plus, it’s delicious with soft pretzels or store bought pretzels alike! Oh my goodness, this is cheesy perfection 🙂 I super love cheddar cheese, so this is right up my alley. I really love your food photography too. I’m in love with this recipe. I hope to make it for the super bowl. Yum. It’s a perfect recipe for game day! Always a big hit! I hope you love it! Wisconsin girl checking in! I love this recipe, and I am loving the sliced brats you have with your cheese dip. I can’t wait to give this one a try. I am partial to Spotted Cow beer from WI in cheese dips. The brats are such a fun accompaniment! It’s nice to break away from the traditional soft pretzels.